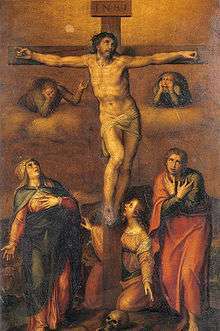 The Sayings of Jesus on the cross (also called the Seven Last Words from the Cross) are seven expressions biblically attributed to Jesus during his crucifixion. Traditionally, the brief sayings have been called "words". They are gathered from the four Canonical Gospels. Three of the sayings appear only in the Gospel of Luke and three only in the Gospel of John. The other saying appears both in the Gospel of Matthew and the Gospel of Mark. In Matthew and Mark, Jesus cries out to God. In Luke, he forgives his killers, reassures the penitent thief, and commends his spirit to the Father. In John, he speaks to his mother, says he thirsts, and declares the end of his earthly life. A person's final articulated words said prior to death or as death approaches generally are taken to have particular significance in meaning. These seven sayings, being "last words", may provide a way to understand what was ultimately important to this man who was dying on the cross. The sparsity of sayings recorded in the biblical accounts suggests that Jesus remained relatively silent for the hours he hung there. The seven-sayings tradition is an example of the Christian approach to the construction of a Gospel harmony in which material from different Gospels is combined, producing an account that goes beyond each Gospel. Several composers have set the Seven Last Words to music. Then Jesus said, "Father, forgive them, for they do not know what they do". This first saying of Jesus on the cross is traditionally called "The Word of Forgiveness". It is theologically interpreted as Jesus' prayer for forgiveness for those who were crucifying him: the Roman soldiers, and apparently for all others who were involved in his crucifixion. It is the only saying that appears in more than one Gospel, and is a quote from Psalms 22:2. This saying is taken by some as an abandonment of the Son by the Father. Other theologians understand the cry as that of one who was truly human and who felt forsaken. Put to death by his foes, very largely deserted by his friends, he may have felt also deserted by God. This statement of Jesus is interpreted by John as fulfilment of the prophecy given in Psalm 69:21 (cf. Psalm 22:15), hence the quotation from John's Gospel includes the comment "to fulfil the scriptures". And speaking in a loud voice, Jesus said, "Father, into your hands I commit my spirit". Hamilton has written that "When darkness seem to prevail in life, it takes faith even to talk to God, even if it is to complain to him. These last words of Jesus from the cross show his absolute trust in God: 'Father, into your hands I commit my spirit'. This has been termed a model of prayer for everyone when afraid, sick, or facing one's own death. It says in effect:"
↑ Richard Young (Feb 25, 2005). Echoes from Calvary: meditations on Franz Joseph Haydn's The seven last words of Christ, Volume 1. Rowman & Littlefield. ISBN 9780742543843. Retrieved 1 April 2012. Interestingly, the Methodist Book of Worship adopted by the General Conference of 1964 presented two services for Good Friday: a Three Hours' Service for the afternoon and a Good Friday evening service that includes the "Adoration at the Cross" (the Gospel, Deprecations, and Adoration of the Cross) but omits a communion service, which would be the Methodist equivalent of the Mass of the Presanctified. ↑ The Encyclopædia Americana: a library of universal knowledge, Volume 13. Encyclopedia Americana. 1919. Retrieved 1 April 2012. 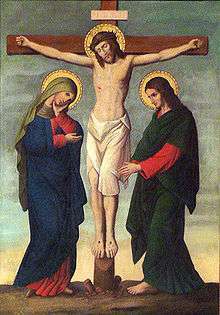 The 'Three Hours' Devotion, borrowed from Roman usage, with meditation on the 'seven last words' from the Cross, and held from 12 till 3, when our Lord hung on the Cross, is a service of Good Friday that meets with increasing acceptance among the Anglicans. 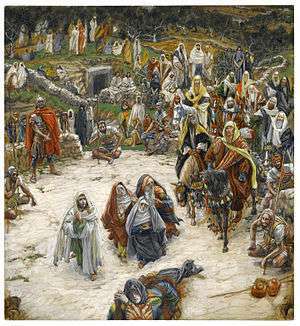 ↑ "John 19:30 When he had received the drink, Jesus said, "It is finished." With that, he bowed his head and gave up his spirit.". ↑ Robertson's Word Pictures of the New Testament (Broadman-Holman, 1973), vol. 1. ISBN 0-8054-1307-3. 1 2 James G. D. Dunn, Jesus Remembered, Eerdmans, 2003, pp. 779–781. ↑ Geza Vermes, The Passion, Penguin 2005, p. 75. ↑ Vermes, Géza. The authentic gospel of Jesus. London, Penguin Books. 2004.